the semifinals of the Abierto Mexicano Telcel in Acapulco. Between them, Sofia Kenin and Cameron Norrie have won five Challenger singles titles in Northern California. Both reached Friday's semifinals in the Abierto Mexicano Telcel in Acapulco in the major leagues of tennis. The fifth-seeded Kenin, from Pembroke Pines, Fla., outlasted wild card and former world No. 1 Victoria Azarenka 6-4, 4-6, 7-5 tonight in 2 hours, 32 minutes on the WTA tour. Kenin captured the title in Sacramento in 2016, Stockton in 2017 and Berkeley last July. Azarenka won the 2010 Bank of the West Classic at Stanford in 2010. Great Britain's Norrie continued his mastery of Mackenzie McDonald, from Piedmont in the San Francisco Bay Area, with a 6-3, 6-2 victory in a matchup of unseeded 23-year-olds and former college stars. Norrie, a left-hander who won back-to-back titles in Tiburon and Stockton in 2017, has not lost more than three games in a set in three career matches against McDonald. Norrie ended his collegiate career at Texas Christian as the No. 1 player in the nation in 2017. McDonald swept the 2016 NCAA singles and doubles titles as a UCLA junior. Both turned pro after their junior year. Bay Area product Mackenzie McDonald. Kenin, ranked No. 35 at age 20, will play Bianca Andreescu, an 18-year-old Canadian. In the other semifinal, third-seeded Donna Vekic of Croatia will play Yafan Wang of China. Norrie will face second-seeded Alexander Zverev of Germany, and unseeded Nick Kyrgios will meet third-seeded John Isner of Dallas. Isner won his first professional title in the 2007 Shingle Springs Futures in the Sacramento area. In an all-brothers doubles quarterfinal tonight, Alexander Zverev and Mischa Zverev edged second-seeded Bob Bryan and Mike Bryan 5-7, 6-4 [10-7]. The Bryan twins led Stanford to the NCAA team title in both of their years there (1997 and 1998) and won the Acapulco title in 2002 and 2004. In the women's doubles quarters, unseeded Sharon Fichman of Canada and Maria Sanchez, a 29-year-old Modesto product, nipped second-seeded Dalila Jakupovic of Slovenia and Irina Khromacheva of Russia 5-7, 6-2 [11-9]. When Sanchez was 10, she lived in Guadalajara, Mexico, for a year with her family. In the other half of the draw, third-seeded Desirae Krawczyk from Palm Desert, Calif., and Giuliana Olmos from Fremont in the Bay Area routed Laura Pigossi of Brazil and Wang 6-3, 6-0. The top women's and men's seeds lost Wednesday in the second round of the Abierto Mexicano Telcel in Acapulco. Fourth-ranked Sloane Stephens, who grew up in Fresno, fell to qualifier Beatrice Haddad Maia of Brazil 6-3, 6-3. Also, Nick Kyrgios of Australia overcame food poisoning and saved three match points to beat Rafael Nadal, the 2005 and 2013 champion, 3-6, 7-6 (2), 7-6 (6) in 3 hours, 3 minutes. The 22-year-old Haddad Maia, ranked No. 172, recorded her first victory over a top-10 opponent in seven matches. She has rebounded from two back operations. Stephens, 25, was playing in her first tournament since losing in the fourth round of the Australian Open last month. "It was just a tough match; obviously she played well," Stephens told reporters. "But I'm not too sad about it. I'm just going to go back and work some more, practice some more and get ready for Indian Wells." Mackenzie McDonald, from Piedmont in the San Francisco Bay Area, ousted sixth-seeded Frances Tiafoe of Orlando, Fla., 6-7 (7), 7-5, 6-3. McDonald will try to reach his second semifinal on the ATP World Tour in two weeks when he plays Cameron Norrie of Great Britain in a quarterfinal matchup of 23-year-olds today at 3 p.m. California time (Tennis Channel). Norrie, a left-hander, surprised fourth-seeded Diego Schwartzman of Argentina 7-6 (5), 4-6, 6-3. Norrie, ranked No. 64, has won both of his matches against McDonald, ranked a career-high No. 71, in straight sets, never losing more than three games in a set. They met twice in the quarterfinals of 2017 U.S. Challengers. Third-seeded John Isner beat U.S. Davis Cup teammate Sam Querrey, who was born in San Francisco, 6-4, 6-4. Querrey won the 2017 Acapulco title. The Stanford women remained No. 4, and the Cardinal men improved one spot to No. 5 in the latest Intercollegiate Tennis Association rankings released today. The Stanford women (6-1) routed visiting Vanderbilt, which slipped one notch to No. 7, 6-1 on Saturday in a rematch of last year's NCAA final. The Cardinal edged the Commodores 4-3 in Winston-Salem, N.C., for its 19th NCAA team title. Stanford will host No. 9 Texas (5-2) on Saturday at noon at Taube Family Tennis Stadium. The Stanford men (9-2) beat UC Davis 4-0 on Friday and Cal 4-2 on Sunday at Stanford. The Cardinal and Bears (2-4), who fell seven places to No. 47, next will play in the Pacific Coast Doubles Championships, Thursday through Sunday in the San Diego suburb of La Jolla. Cal also will face No. 32 Oklahoma State (6-3) on Thursday in La Jolla. The Cal women (5-3) jumped eight notches to No. 16 after losing to Vanderbilt 4-3 on Friday and UCLA 4-3 on Saturday and defeating USC 5-2 on Sunday in Berkeley. The Bruins remained No. 5, and the Women of Troy plunged 15 spots to No. 32. Cal will host UC Santa Barbara (4-3) on Saturday at noon at the Hellman Tennis Complex. The next team, singles and doubles rankings will be released March 5. Stanford had a lot to celebrate today. The Bryan brothers (1997-98) captured the doubles title in the Delray Beach Open, Nicole Gibbs (2011-13) won an all-Stanford singles final on the women's Challenger circuit, and the Cardinal men beat visiting Cal 4-2 in the Big Slam. Top-seeded Bob and Mike Bryan, 40-year-old natives of Camarillo in the Los Angeles area, beat second-seeded Ken and Neal Skupski of Great Britain 7-6 (5), 6-4 for their fifth Delray Beach title, 117th overall and first since last April in Monte Carlo. It was the first all-brothers doubles final on the ATP World Tour since 1977, when Vijay and Anand Amritraj of India beat John and David Lloyd of Great Britain 6-1, 6-2 at Queen's Club in London. Bob Bryan injured his right hip in the Madrid final last May, had replacement surgery in August and returned to the circuit in January. "We're very, very, very pleased with how this week's gone," Bob Bryan said on atptour.com. "Our expectations ... have been a little bit lower than they have in the past. We've just been trying to have fun and enjoy our time together, and it's actually resulted in some really good play. We didn't lose a set this week. We're taking care of our serve and just weathering the tough times during matches." Unseeded Radu Albot of Moldova won the singles title, saving three championship points in a 3-6, 6-3, 7-6 (7) victory over qualifier Daniel Evans of Great Britain. Evans, 28, double-faulted on the 29-year-old Albot's third championship point. Albot also lost the first set in the quarterfinals and semifinals. Both 5-foot-9 (1.75-meter) finalists were seeking their first ATP title. Gibbs, seeded second, outplayed Kristie Ahn (2011-14), seeded fifth, 6-3, 6-3 in the $25,000 Shoebacca Women's Open in the San Diego suburb of Rancho Santa Fe. Gibbs, who will turn 26 next Sunday, improved to 5-0 against Ahn, 26, and claimed her sixth Challenger singles crown (all in the United States). The pair led Stanford to the 2013 NCAA team title. The No. 6 Stanford men (9-2), coached by Paul Goldstein, rallied to defeat No. 40 Cal (2-4) after losing the doubles point. Sameer Kumar, ranked 31st, clinched the victory by beating 6-2, 6-4 Yuta Kikuchi on Court 3. The No. 24 Cal women defeated No. 17 USC 4-2 in Berkeley. Maria Smith won the clincher, beating Becca Weissmann 6-3, 6-3 on Court 5. The Bears improved to 5-3, and the Women of Troy dropped to 4-2. Back on the ATP World Tour, unseeded Jeremy Chardy and Fabrice Martin of France topped third-seeded Ben McLachlan (Cal, 2011-14) of Japan and Matwe Middelkoop of the Netherlands 6-3, 6-7 (4) [10-3] to win the Open 13 Provence in Marseille. Roundup: McDonald falls in Delray Beach semis, etc. Both Mackenzie McDonald and Radu Albot are small and fast. Both were seeking their first ATP Tour final. The difference tonight was experience. Coming from behind for the second consecutive match, the 29-year-old Albot defeated the 23-year-old McDonald 3-6, 6-0, 6-0 in a semifinal matchup of unseeded players in the Delray Beach Open. It was Albot's second ATP semifinal in three weeks and third overall. The 5-foot-10 (1.78-meter), 160-pound (73-kilogram) McDonald, from Piedmont in the San Francisco Bay Area, had never been that far until this week. Albot, 5-foot-9 (1.75 meters) and 152 pounds (69 kilograms), trailed by a set and a service break in his 1-6, 6-3, 7-6 (5) quarterfinal victory over fourth-seeded Steve Johnson of Redondo Beach in the Los Angeles region. Albot, ranked 82nd, evened his career record against McDonald, ranked 84th, at 1-1. McDonald won 2-6, 6-3, 6-1 in the second round of qualifying in Shanghai last October. The Delray Beach Open will produce a first-time ATP Tour champion, as Albot is scheduled to play qualifier Daniel Evans of Great Britain on Sunday. Evans, also 5-foot-9 (1.75 meters), stunned second-seeded John Isner 3-6, 6-2, 6-3, breaking the 6-foot-10 (2.08-meter) American's serve three consecutive times. Evans also ousted third seed and defending champion Frances Tiafoe in the first round and sixth seed Andreas Seppi of Italy in the quarterfinals. In doubles, Bob Bryan and Mike Bryan reached their first final since Bob underwent right hip replacement surgery last August and their seventh in Delray Beach. The 40-year-old Bryan twins (Stanford, 1997-98) beat unseeded Marcelo Arevalo of El Salvador and Jamie Cerretani of Reading, Mass., 6-3, 7-5. The Bryans, seeking their fifth Delray Beach title, will face brothers Ken Skupski, 35, and Neal Skupski, 29, of Great Britain. Seeded second, they downed unseeded Albot and Yoshihito Nishioka of Japan 6-4, 6-2. Open 13 Provence -- Third-seeded Ben McLachlan (Cal, 2011-14) of Japan and Matwe Middelkoop of the Netherlands will play unseeded Jeremy Chardy and Fabrice Martin of France for the title in Marseille, France. McLachlan, a New Zealand native who plays for his mother's native country, and Middelkoop beat unseeded Jurgen Melzer and Philipp Oswald of Austria 3-6, 7-5 [10-7] on Friday. Women's Challenger -- Former Stanford teammates Nicole Gibbs and Kristie Ahn will meet in the final of the $25,000 Shoebacca Women's Open in Rancho Santa Fe in the San Diego area. In the all-American semifinals, the second-seeded Gibbs, 25, outlasted 18-year-old Ann Li 3-6, 6-3, 6-4, and the fifth-seeded Ahn, 26, routed 20-year-old qualifier Usue Arconada 6-1, 6-1 in 72 minutes. Gibbs is 4-0 against Ahn. This will be their first meeting since Gibbs' 6-2, 7-5 victory in the quarterfinals of the $50,000 Waco (Texas) Challenger in November 2015 and their first in a final. Gibbs and Ahn led Stanford to the 2013 NCAA championship. Men's Challenger -- Fourth-seeded Andre Goransson (Cal, 2014-17) of Sweden and Marc-Andrea Huesler of Switzerland nipped third-seeded Gonzalo Escobar of Ecuador and Luis David Martinez of Venezuela 6-3, 3-6 [11-9] in the final of the $54,160 Morelos (Mexico) Open. Goransson, 24, won his third Challenger doubles title. His first came in the $100,000 Tiburon (Calif.) Challenger in 2017 with former Cal teammate Florian Lakat of France. College women -- No. 4 Stanford dominated No. 7 Vanderbilt 6-1 at Stanford in a rematch of the 2018 NCAA final. Janice Shin, ranked 58th, gave the Cardinal (6-1) a 5-1 lead with a 6-1, 7-6 (3) victory over Carolyn Campana, a freshman from Hillsborough, on Court 5. Vanderbilt's victory came on Court 1 as third-ranked Fernanda Contreras edged 16th-ranked Michaela Gordon, a sophomore from Saratoga, 7-6 (6), 0-6 [14-12]. No. 40 Melissa Lord and Niluka Madurawe, a freshman from Sunnyvale, clinched the doubles point for Stanford on Court 3. No. 15 Emily Arbuthnott and Gordon of Stanford were tied 4-4 on Court 2 when their match was abandoned. Hillsborough, Sunnyvale and Saratoga are in the Bay Area. Stanford nipped Vanderbilt 4-3 last May in Winston-Salem, N.C., for its 19th NCAA team title. In Berkeley today, No. 5 UCLA edged No. 24 Cal 4-3. In the deciding match, Abi Altick nipped 69th-ranked Anna Bright 1-6, 6-4, 7-6 (5) on Court 4. UCLA's Alaina Miller, a senior from Saratoga, won at No. 5 singles and No. 3 doubles. Mackenzie McDonald reached two milestones in his blossoming career tonight. The 23-year-old product of Piedmont in the San Francisco Bay Area recorded his first victory over a top-10 player to reach his first ATP Tour semifinal. However, there was a catch. McDonald's opponent, Juan Martin del Potro, was playing in his first tournament since breaking his right kneecap in Shanghai in October. The unseeded McDonald, ranked 84th, edged the top-seeded del Potro, ranked fourth, 6-4, 3-6, 7-6 (5) in the Delray Beach Open. Del Potro played with his knee heavily taped, and his mobility was limited during the 2-hour, 18-minute battle. McDonald, now based in Orlando, Fla., will surpass his career high of No. 76 in Monday's updated rankings. The Delray Beach Open is guaranteed to have a first-time ATP finalist, as the 5-foot-10 (1.78-meter) and 160-pound (73-kilogram) McDonald is scheduled to meet Radu Albot, 29, of Moldova at 5 p.m. California time (Tennis Channel). Albot, even smaller than McDonald at 5-foot-9 (1.75 meters) and 152 pounds (69 kilograms), surprised fourth-seeded Steve Johnson of Redondo Beach in the Los Angeles area 1-6, 6-3, 7-6 (5). In the other semifinal, second-seeded John Isner of Dallas is set to play qualifier Daniel Evans of Great Britain at noon (Tennis Channel). The 6-foot-6 (1.98-meter) del Potro, who won the 2011 Delray Beach title, blasted 16 aces and won 81 percent of the points on his first serve (48 of 59) against McDonald. Del Potro, though, converted only one of six first serves in the tiebreaker. McDonald pounded nine aces and won 82 percent of the points on his first delivery (40 of 49). It was the first meeting between del Potro, who defeated Roger Federer to win the 2009 U.S. Open before undergoing four wrist operations, and McDonald, who reached the fourth round at Wimbledon last July. College women -- Cal's Julia Rosenqvist shocked the nation's third-ranked player, but the No. 24 Bears lost to No. 7 Vanderbilt 4-3 in Berkeley. In the deciding match, ninth-ranked Christina Rosca defeated 20th-ranked Olivia Hauger 6-4, 3-6, 6-3 on Court 2. Rosenqvist, ranked 45th, beat Fernanda Contereras 2-6, 6-4, 6-0 on Court 1. Stanford (5-1) will host Vanderbilt (5-2) on Saturday at noon in a rematch of the NCAA final last May. The Cardinal won 4-3 for its 19th NCAA team title. Serena Williams returned to the top 10 this week for the first time since July 2017. Williams, a 37-year-old part-time resident of Silicon Valley, rose one spot to No. 10. She has not played since reaching the quarterfinals of last month's Australian Open, but other players have failed to defend their ranking points. Williams went on maternity leave after winning the 2017 Australian Open and returned in March 2018. She fell as low as No. 491 last March before advancing to the Wimbledon and U.S. Open finals. Sloane Stephens, a 25-year-old Fresno product, improved one spot to a career-high No. 3. Naomi Osaka remained No. 1, and Simona Halep rose one notch to No. 2. College rankings -- The Stanford men (7-2) jumped from No. 10 to No. 6 after beating then-No. 4 Florida 4-1 on Sunday in the consolation bracket of the ITA National Men's Team Indoor Championship in Chicago. Cal (2-3), which stunned then-No. 5 USC 4-3 in Los Angeles on Feb. 9, went from unranked to No. 40. Stanford's Axel Geller fell three places to No. 13 in singles, and Cal's Yuta Kikuchi and Jacob Brumm dropped five spots to No. 13 in doubles. In the women's team rankings, defending NCAA champion Stanford (5-1) slipped one place to No. 4, and Cal (4-1), which shocked then-No. 7 Pepperdine 4-3 in Malibu on Saturday, rose one notch to No. 24. Stanford's Michaela Gordon, a sophomore from Saratoga in the San Francisco Bay Area, improved seven spots to No. 16 in singles. She defeated then-No. 19 Eden Richardson, who won the NCAA doubles title last year with LSU teammate Jessica Golovin, on Feb. 8. The Cardinal's Emily Arbuthnott fell five places to No. 19, and Cal's Olivia Hauger jumped eight spots to No. 20. Hauger topped Pepperdine's Evgeniya Levashova, who was ranked No. 13 at the time. Cal's Anna Bright and Jasie Dunk slipped one notch to No. 23 in doubles. Because of a technical problem, the donation button on my website has not been working. I apologize for the inconvenience. The problem, probably caused by an application update, might take a week or two to resolve because my computer tech is traveling in Asia until March 6. I'll let you know when the button works again. The No. 10 Stanford men lost to No. 13 Virginia 4-2 today in the first round of the ITA National Men's Team Indoor Championship in Chicago. Carl Soderlund, a junior from Sweden, beat Axel Geller, a sophomore from Argentina, 6-4, 7-5 on Court 1 to clinch the victory for the Cavaliers (8-1). Stanford (6-2) will play No. 19 Tulane (4-4) on Saturday in the consolation bracket. The Green Wave lost to No. 2 Ohio State 4-0. The first day of the Fed Cup tie between the United States and Australia went according to form. Ashleigh Barty, ranked 13th, held off 37th-ranked Sofia Kenin, 6-1, 7-6 (2) in 79 minutes today to give Australia a 1-0 lead in the first round of the best-of-five-match competition on an indoor hard court in Asheville, N.C.
Madison Keys, ranked 17th, pulled the United States even with a 6-2, 6-2 victory over Kimberly Birrell, ranked 157th, in 63 minutes. Absent from the tie are the United States' top two singles players, No. 4 Sloane Stephens and No. 11 Serena Williams, and Australia's second-highest-ranked singles competitor, No. 41 Ajla Tomljanovic. The United States leads all nations with 18 Fed Cup titles. The Czech Republic is second with 11, followed by Australia with seven. The U.S. has reached the last two Fed Cup finals, beating host Belarus in 2017 and losing at the Czech Republic last November. Australia seeks its first title since 1974 and first berth in the finals since 1993. The 5-foot-5 (1.66-meter) Barty, a quarterfinalist in last month's Australian Open, pounded 10 aces to Kenin's one and won 91 percent of the points on her first serve (29 of 32). With Barty serving for the match at 5-4 in the second set, Kenin saved two match points and broke on a double fault. Kenin, a Moscow native who moved to Florida as a young child, has excelled in Northern California Challengers, winning titles in 2016 (Sacramento), 2017 (Stockton) and last year (Berkeley). Kenin won her first WTA title in Hobart in early January and lost to then-No. 1 Simona Halep in the second round of the Australian Open after leading 4-2 in the third set. 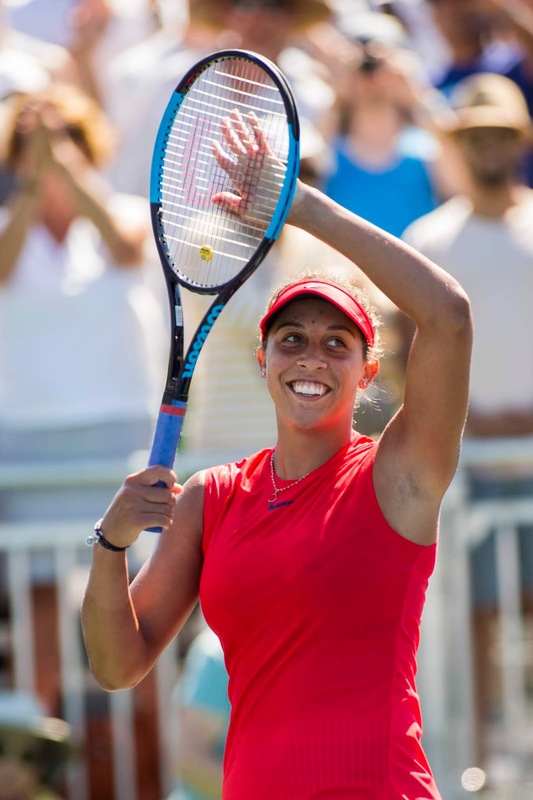 Keys, who won the last Bank of the West Classic at Stanford in 2017, never faced a break point against Burrell, who underwent elbow surgery in 2016 and lost in the first round of the Berkeley Challenger last July to Modesto product Maria Sanchez. Kenin and Birrell, both 20, were chosen over higher-ranked, older players. Danielle Collins, an Australian Open singles semifinalist ranked 23rd at age 25, is scheduled to play doubles only for the United States on Sunday in her Fed Cup debut. Kenin fell to 0-3 in the Fed Cup, including two close singles losses in last year's final. Birrell stunned then-No. 10 Daria Kasatkina in the first round in Brisbane in the first week of January and reached the third round of the Australian Open. Meanwhile, 47th-ranked Daria Gavrilova is 0-4 this year. Gavrilova, a 24-year-old Moscow native, won the doubles title in the 2014 Sacramento Challenger with compatriot Storm Sanders. It was Gavrilova's first tournament since undergoing surgery for a torn ACL only eight months beforehand. In Sunday's reverse singles, Keys is scheduled to face Barty at 10 a.m. PST (Tennis Channel), followed by Kenin against Birrell. Keys defeated Barty 6-3, 6-2 in the first round of the 2017 French Open in their only career meeting. Kenin and Birrell have not played each other. In the fifth rubber, Collins and Nicole Melichar are set to take on Barty and Gavrilova. ATP Challenger Tour -- No. 14 seed Mitchell Krueger, playing in his hometown, reached the final of the $135,400 RBC Tennis Championships of Dallas when No. 6 seed Bjorn Fratangelo of Orlando, Fla., withdrew because of a quadriceps injury. Fratangelo won the $100,000 Fairfield (Calif.) Challenger last October. Krueger, 25, will face top-seeded Mackenzie McDonald, a 23-year-old product of Piedmont in the San Francisco Bay Area. McDonald, who's featured in Tennis Channel's "My Tennis Life" this year, beat third-seeded Reilly Opelka, 21, of Palm Coast, Fla., 6-4, 7-6 (13) in a late match. McDonald converted his fourth match point and saved four set points in the tiebreaker. At 6-foot-11 (2.11 meters), Opelka towers over the 5-foot-10 (1.78-meter) McDonald, a former UCLA star who won the 2017 Fairfield Challenger. McDonald, ranked No. 91, is 4-1 against Krueger, ranked No. 209. They met two weeks ago in the second round of the $162,480 Newport Beach Challenger, with McDonald winning 6-3, 6-4. In the doubles semifinals, U.S. wild cards and former UCLA teammates Marcos Giron and Dennis Novikov nipped second-seeded Romain Arneodo of Monaco and Andrei Vasilevski of Belarus 6-7 (4), 6-4 [11-9]. Giron and Novikov, a 25-year-old San Jose product, will meet unseeded Ante Pavic of Croatia and Ruan Roelofse of South Africa. They edged unseeded Ruben Gonzales of the Philippines and Alex Lawson of Tempe, Ariz., 6-4, 5-7 [10-8]. McDonald and Giron won three NCAA individual championships combined. McDonald swept the singles and doubles titles in 2016, and Giron took the singles crown in 2014. ITA National Women's Team Indoors -- Today's quarterfinals in the ITA National Team Indoor Championships in Seattle were postponed because of dangerous road conditions. The Seattle area received more than six inches of snow on Friday. Top-ranked Stanford (4-0), the defending NCAA champion, is scheduled to play No. 6 Texas (4-1) on Sunday at 10 a.m. The Cardinal routed No. 18 LSU 4-0 on Friday in the opening round. Seventeen-year-old wild cards aren't supposed to mow down veteran pros, some ranked in the top 100, and win $100,000 tournaments without losing a set. But that's exactly what Caty McNally did in the Dow Tennis Classic in Midland, Mich. The Cincinnati native and resident outclassed fourth-seeded Jessica Pegula of Boca Raton, Fla., 6-2, 6-4 on Sunday for her second consecutive title. McNally also won a $25,000 hard-court tournament in Lawrence, Kan., last November. "She didn't really start making any errors until about the end of the second set when I started coming back," the 24-year-old Pegula, who suffered her eighth consecutive loss in a WTA or an ITF singles final, told reporters. "She's playing with a lot of confidence and kind of no fear, (and it's) tough to play against someone like that who's young and doesn't really feel the pressure." McNally, who has won two doubles titles and reached one singles final in junior Grand Slam tournaments, never lost more than four games in a set in Midland. She knocked off four seeds: No. 7 Nicole Gibbs (Stanford, 2011-13) in the first round, No. 3 and defending champion Madison Brengle in the quarterfinals, No. 1 Rebecca Peterson in the semifinals and Pegula. Peterson was ranked No. 57, and Brengle was No. 80, marking McNally's first two victories over top-100 players. Brengle won the $60,000 Stockton (Calif.) Challenger last October, and Gibbs reached the final of the inaugural $60,000 Berkeley Challenger last July. McNally and Pegula, the daughter of Buffalo Bills and Sabres owners Terrence and Kim Pegula, reached the doubles quarterfinals before losing to eventual champions Olga Govortsova of Belarus and Valeria Savinykh of Russia. McNally soared 158 places to No. 253 in the world singles rankings and collected $15,239 for the title. The only younger players ranked ahead of her are 16-year-olds Marta Kostyuk of Ukraine at No. 195 and Whitney Osuigwe of Bradenton, Fla., at No. 220. Pegula improved 11 notches to No. 93, cracking the top 100 for the first time, and earned $8,147 as the runner-up. 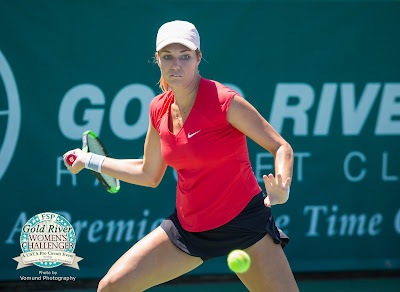 She reached the semifinals in Stockton last year and the final of the $50,000 Sacramento Challenger in 2012. Unseeded Kristie Ahn, a 26-year-old Stanford graduate, surprised fifth-seeded Marie Bouzkova, a 20-year-old Czech, 6-3, 6-2 on Thursday to reach the quarterfinals of the $100,000 Dow Tennis Classic in Midland, Mich.
Ahn, an American ranked No. 220, is scheduled to play top-seeded Rebecca Peterson of Sweden today. Peterson, ranked No. 57, dismissed 14-year-old wild card Cori (Coco) Gauff of Delray Beach, Fla., 6-2, 6-1 in 56 minutes. Gauff, at 13, became the youngest player to reach the U.S. Open girls final and, at 14 last year, the youngest to capture the French Open girls title since Martina Hingis won her second crown there in 1994 and the fifth-youngest all time. Third-seeded Madison Brengle of Dover, Del., beat Jamie Loeb of Ossining, N.Y., 6-1, 6-4 in a rematch of last year's final, won by Brengle 6-1, 6-2. Brengle also won the $60,000 Stockton (Calif.) Challenger last October. In the doubles quarterfinals on Thursday, Bouzkova and Jill Teichmann of Switzerland crushed Jovana Jaksic, a 25-year-old Serb living in Sacramento, and Lu Jia-Jing of China 6-0, 6-1 in 44 minutes in a clash of unseeded teams.